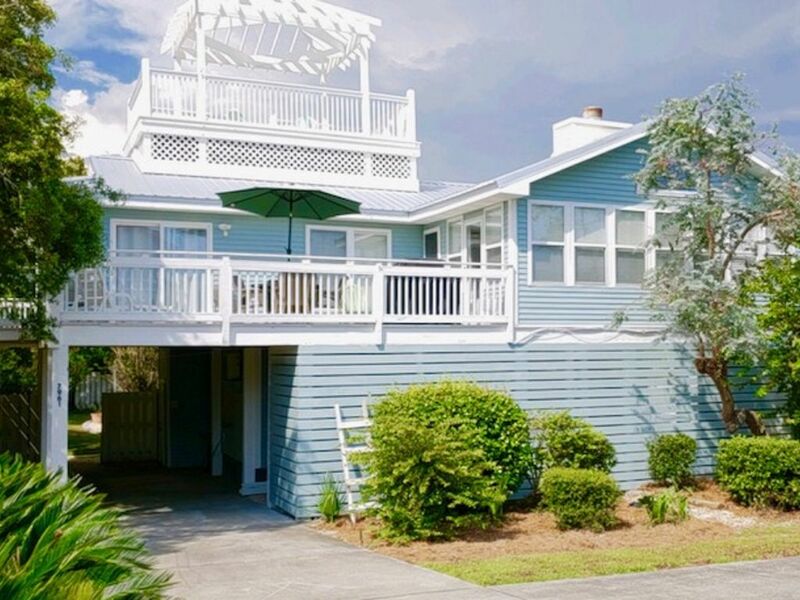 This home is called Beach Haven because it is truly a haven of fun and relaxation. It is a very unique situation as it's very quiet and private while being very close to many restaurants, shopping, ice cream, golf, tennis and many other things. (It is in walking distance of "The Hub"). It is the perfect place to bring your family for a beach vacation. Unfortunately, we cannot accept renters that are high school or college students or under the age of 25. This is not a home to rent for large parties as the permanent residents close by will notify us if this happens. This is on the corner of 30A and Seabreeze Court if you are looking at a map. Unique to the beach, it has lots of covered parking to accommodate more than one car or boat, as well as trailers. It has a fenced in back yard with a pool that is great for children to play. In addition to the house itself, there is a widow's walk on top for awesome sunset viewing in the evening. The beautiful emerald water is just steps away with a designated walkway that heads right to the secluded beach that is never crowded. We think it is the perfect vacation spot! We chose this location because it is quiet and uncrowded on the beach, but yet we are close to everything else we like to do....biking, shopping, golf, tennis, and eating out. Having the private pool is a great benefit, especially if the gulf is rough, or has seaweed, etc. Seems like my kids hang out at the pool mostly (also much closer to the refrigerator, haha). Not on the beach, but very close...about a 3 minute walk. Beach walkover is across from house. We have two dining areas. One seats 6-8 and the other 4. In the fenced-in back yard. We had a wonderful time. House is very nice and location is perfect. Easy bike ride to The Hub and Rosemary. We were there July 2018, the home was nice, but when we booked this the home it was yellow. I wish they had told us that as we came in later due to a 3 hour traffic jam and it would have been nice to know that update. We had a few issues upon arrival, one bathroom sink was stopped up, one bathroom had a leak and I wish it had BETTER PILLOWS, those flat skinny ones are awful. I finally went and bought my own. The home was nice and if you like the beach you do have to walk across the street and down the road slightly to get access to the beach and then there are a lot of stairs so if you are older, back issues, or breathing issues it might be a bit to handle that. It was nice that it was right on the main street, we did have to drive to everywhere, but we are on vacation so we did not mind that and it is not in the heart of all the shops at all. I did like the swing in the breezeway and the pool was very nice. We go on family vacation the first week of July each year, it is my son's and granddaughter's birthdays, hers is the 4th of July. The lookout area at the top had a lot of stairs to climb, but the view is worth it. The one thing that should be fixed is the rusty nails on the deck, they were out and being barefoot was not good, so we wore shoes all the time to avoid issues. The only thing too the street noise is loud especially in the bedrooms. The home was nice and I would recommend it, I hope they fix the few issues mentioned. We loved your home! Check in to check out, everything was a breeze. Four minute walk to beach access and crosswalk across the street was perfect. Close enough if you want to go out, but feels off the beaten path. The AC was powerful during a hot week. We enjoyed after dinner swims in the pool. Home was perfect for kids. Plenty of outdoor seating. We really enjoyed our time at Beach Haven. The house is in a great location and within an easy walk to the beach. Public beach access is just yards away. The house is in the process of being painted blue, so we passed it up to begin with. It is tastefully decorated in beach theme. The beds were comfortable and each room with its own flat screen TV. The house was well cleaned. Upon arrival the pool was dirty and seemed to have a problem with the pump. We notified Southern Vacation Rentals and they sent out the property manager quickly. Chris was wonderful. He worked on the pool and also cleaned behind the refrigerator that had a bad odor coming from it. He had an electrician come out to check the pump and the lights at the pool. The pool cleaners came twice the next day. The staff at Southern Rentals were wonderful. They followed up with text to make sure all was good. We were very pleased with their service. The kitchen is well stocked with pots, dishes, and glassware. There is a stock pot for shrimp boil, but no lid could be found. We improvised with a pizza pan. The can opener definitely needs to be replaced. Bring some storage containers for leftovers as there are none. We were only provided one dish cloth and two disposable dish rags. I recommend you bring your own. Also bring extra wash cloths as there was only about one each for our party of 6. The wireless internet is pretty lacking. We didn't report the problem, so it might have been fixable. We did reboot the router, but that didn't seem to help. Although Netflix is available, there's no chance of streaming a video. Just getting Internet service took lots of patience. Overall we really enjoyed our stay. The porches were great for sitting and the top deck provided a great place for watching the sunset. Thanks for your comments and we are so glad you enjoyed your stay! Sorry for the half painted house :) as it was supposed to be done before rental season but 21 straight days of rain in May set us off track. It is mostly done now (aside from some of the trim work) and I will update photo on VRBO as soon as I get a good one taken! The internet was a regional problem and was out for 10 days. It is back up and running like a charm now! Sorry for the lack of storage containers. There was a batch of new ones at the beginning of the season but somehow those things seem to "disappear" quickly. Loved it the private pool big hit with the grandchildren !! Would love to return soon Sara !! Beach Haven was the perfect place for our family! We want the same place next year! Check-in is 4pm and Check-out is 9am during summer months.